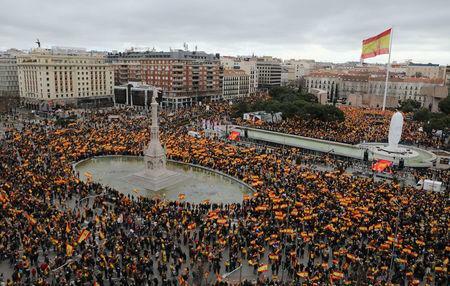 MADRID (Reuters) - Tens of thousands of people waving Spain's red-and-yellow flag demonstrated in Madrid on Sunday to oppose any concessions by the government to Catalan pro-independence parties and to call for early elections. Demonstrators chanting "Spain! Spain!" and "We want to vote!" filled the Plaza de Colon in the city center in the largest protest Socialist Prime Minister Pedro Sanchez has faced in eight months in office.